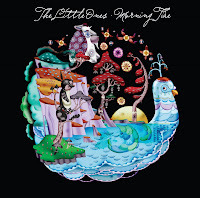 Atlas and the Anchor: The Little Ones - "Morning Tide"
Finally...after a critically acclaimed EP, a recent self-released EP, and over two years of label woes and waiting, The Little Ones have released their first full-length, "Morning Tide". You would think that all of these complications would bring a band down, well if so, their music doesn't show it. Brimming with quirky, upbeat, infectiously catchy indie-pop, the new songs practically beg you to sing and dance along. Although comparable to 60's pop legends, The Beach Boys, Kinks, and Zombies and modern day acts such as The Shins and Death Cab For Cutie, they put their own sunny spin on pop with enough hand-claps, "Oh, Oh's" and harmonies to spoil your sweet tooth! "Tangerine Visions" builds off of a giddy Mellotron line before giving way to the lifting, atmospheric pop of the chorus. "Everybody's Up To Something" bounces along on a bass line with an anthemic sing along that is already becoming a live favorite. The chamber pop of album closer, "Farm Song", would make Jon Brion proud with it's gorgeous orchestral arrangement and sweet harmonies. "Morning Tide", released 10/7 on Chop Shop Records will find it's way into your home whether you know it or not. Chop Shop is headed up by Alexandra Patsavas, who is known for supervising the music heard on many of your favorite TV shows, like O.C., Grey's Anatomy, and Gossip Girl, which has already featured the song "Morning Tide" in an episode. The Little Ones are poised to become much bigger than their name suggests.